Let me start off by saying that there is a fundamental difference between a movie and a film. An example of a movie is Ghostbusters. An example of a film is Braveheart. Evita is a film. It is an epic film. 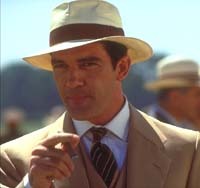 It is also a musical, which, in my book gives it an unfair advantage over other films and movies. Tim Rice (The Lion King, Phantom of the Opera) put the words to Andrew Lloyd Webber's musical masterpiece many years ago: in the mid 70's. Webber is, of course, responsible for hit after musical hit: Jesus Christ Superstar, The Phantom of the Opera, Cats, Starlight Express, etc. However, under director Alan Parker's duress these two conceded to write a new song so that the ending of the movie could be reorganized. The result: "You must love me" which won a Golden Globe award for best original song. Another song which has been and will be loved forever is "Don't Cry for me Argentina". The music of this movie is exceptional as are the other aspects of the film. The music in this movie is powerful, touching, and, for me, seemed to grab my emotions as it went for a ride. The soundtrack for this movie, by the way, took a year and a half to record. Madonna, however, was not alone. Antonio Banderas completely took me by surprise as the ever-present Che. He was great! He proves here that he is very talented. I also enjoyed the performance of Jonathan Pryce in the role of President Juan Per�n. In fact, everyone in this film was perfect. This includes the over 40,000 extras that were needed to create this wonderful film. However, what truly impressed me was the cinematography. I do not think that I have ever seen a film so real, yet so amazingly artistic. The color of each scene set the appropriate mood. Shadows appeared in the perfect places. And the lines on peoples faces and the moisture in their eyes seemed to imitate the music. The movie begins with thousands upon thousands mourning the loss of Eva Per�n. Why and how could so many feel this way? The answer to this question is the remainder of the film. 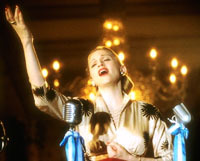 How would you rate the movie Evita? There have been 8574 people to visit this page since Fri, Feb 7, 1997. And you are the first person to visit this page today!